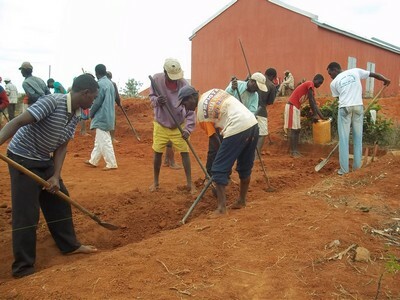 One of our favorites, Marianina in Madagascar, sends us some news of their projects. Here are some pictures of the parents of college students in Marianina at work to begin at the tail the foundations of the third building. According to the traditions of the country, for the laying of the first foundation stone by the representative of the mayor, a small ceremony was held in the presence of officials and village elders. The SBA has contributed to this project to build the third building financing € 2,500 which will be used to purchase materials: stones, bricks, cement, etc … for the progress of the construction. We will keep you informed of the progress of the project!